I have been enjoying the cardio workouts every other day and strength training the other days of the week. First, I was a little worried about hurting my self during the work outs after all I am not a spring chicken. I started out slow and was careful not to do anything that caused pain. Now I am really feeling great about my work outs. I have increased energy and I am not craving sweets! Last, but not least I have lost 3 lbs!! Now, that I did not expect so soon. I owe this all to Dustin Maher the author of the book Fit Moms For Life. There are two more weeks to go for this challenge and I plan to keep pushing my self to go as far as I can. 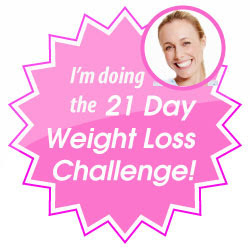 If you would like you can check out some of the other moms in the 21 day weight loss challenge. I'm still rooting for you!! Great job! I love coming to check out your updates...and love your header pic! Three pounds...that's fantastic! Way to go! Good for you! Congrats on the weight loss.